The remarks, in a televised speech hours before Mr. Karzai’s meeting with U.S. Defense Secretary Chuck Hagel, capped a series of confrontations between the Afghan president and the U.S. over his demands to assert Afghan sovereignty and curtail American military operations. Mr. Karzai met Mr. Hagel a day after suspected Taliban suicide bombers killed at least 18 people at the Ministry of Defense in Kabul and in the eastern province of Khost. In his address, Mr. Karzai said the U.S. doesn’t want to leave the country after the NATO coalition’s mandate expires at the end of 2014 because it covets Afghan resources and is talking with Taliban leaders behind his back. “We have fought too hard over the past 12 years, we have shed too much blood over the last 12 years, we have done too much to help the Afghan security forces grow over the last 12 years to ever think that violence or instability would ever be to our advantage,” he said. Mr. Karzai’s remarks blindsided American officials who had hoped to use Mr. Hagel’s two-day visit, his first overseas trip as defense secretary, to shore up fragile relations with the Afghan president as the U.S. ends its longest foreign war. Though most of the 66,000 U.S. troops now in Afghanistan are slated to go home next year, the U.S. hopes to leave behind an advisory and counterterrorism force that would support the Afghan government after 2014. American defense officials now have to assess how much damage Mr. Karzai’s allegations will have on their plans, already threatened by discord over whether to grant immunity from prosecution to U.S. troops and by the Afghan leader’s refusal to negotiate with the North Atlantic Treaty Organization. The war against the Taliban has claimed the lives of 2,179 American service members since 2001, says the casualty tracking website icasualties.org. While the U.S. has held talks with the Taliban in the past, contacts were stalled by the Taliban’s refusal to negotiate directly with Kabul. Mr. Karzai’s speech on Sunday sparked some frank exchanges during Mr. Karzai’s dinner at the presidential palace with Mr. Hagel, Gen. Dunford and other officials from both nations, U.S. officials said. Mr. Hagel “struck the right balance between expressing support for Afghanistan and strongly pushing back on wildly inaccurate claims,” one U.S. official said. After the dinner, Mr. Hagel offered a muted public response to Mr. Karzai’s comments that came in contrast to the forceful defense from Gen. Dunford. “I told the president it was not true that the United States was unilaterally working with the Taliban,” Mr. Hagel told reporters. The defense secretary suggested that the Afghan president might have been baiting America to cultivate support from anti-Western forces in the politically fractured country. Mr. Karzai’s term expires next year, and the field of potential successors is wide open, ranging from his brother and other allies to bitter political foes. “I was once a politician, so I can understand the kind of pressures that especially leaders of countries are always under, so I would hope that, again, we can move forward—and I have confidence that we will,” Mr. Hagel said. The Afghan president’s spokesman, Aimal Faizi, said the Afghan leader used the occasion to complain about civilian casualties of U.S. operations and the detentions of Afghan citizens. In particular, Mr. Faizi said, Mr. Karzai raised the issue of an engineering student who, he said, had been seized illegally at Kandahar University by an Afghan militia working for the Central Intelligence Agency. Mr. Karzai mentioned in his speech that he was up until as late as midnight on Saturday to win the student’s release; on Sunday, he issued a decree banning foreign forces from entering universities and detaining Afghan students. Mr. Karzai gained power following the U.S. ouster of the Taliban regime in 2001, and initially enjoyed close ties with the U.S., holding weekly videoconference calls with President George W. Bush. These relations deteriorated during the 2009 Afghan presidential elections, after which Mr. Karzai accused some Obama administration officials of scheming to oust him. In previous statements, Mr. Karzai also alleged that the U.S. was secretly flying insurgents into northern Afghanistan in helicopters, as part of a plan to destabilize the country, and once even threatened to join the Taliban himself. Mr. Karzai and Mr. Hagel have a strained personal history. In 2008, Mr. Hagel joined fellow Senators Joe Biden and John Kerry for a turbulent dinner in which they pressed the Afghan president to seriously tackle corruption in his government. When Mr. Karzai dismissed the concerns as unfounded, Mr. Biden stormed out of the meeting, throwing down his napkin. Mr. Hagel’s restrained comments on the Afghan president Sunday suggested that U.S. leaders recognize that they need Mr. Karzai’s cooperation to complete the withdrawal of U.S. troops and equipment. Military analysts said Mr. Karzai might be trying to challenge Mr. Hagel, who has orders from President Barack Obama to quickly end the war. “President Karzai has a history of testing new [coalition] commanders to see what the response is to his demands,” said Kimberly Kagan, founder of the Institute for the Study of War who has consulted with the U.S.-led forces in Afghanistan. U.S. officials have envisaged that NATO allies would make up a large part of the residual force after 2014. Mr. Karzai, however, on Sunday reiterated his opposition to any deal with NATO as a whole, saying nations wanting to keep troops here would need to negotiate directly with Kabul. 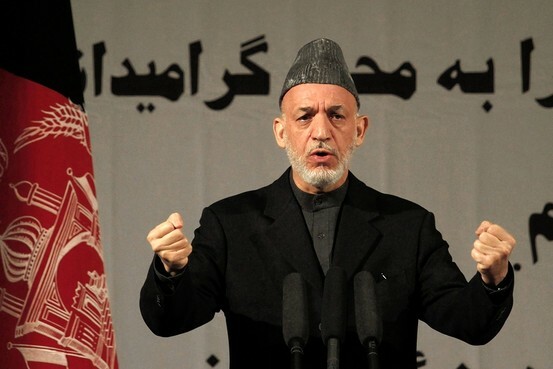 But Mr. Karzai’s Sunday speech was only one such shock to the relationship. It followed the U.S.’s abrupt cancellation of its planned handover of the main U.S. detention facility at Bagram Air Field, and Mr. Karzai’s demand that U.S. Special Operations forces leave the strategic province of Wardak near Kabul. Following Mr. Karzai’s speech, Mr. Hagel also canceled a planned joint news conference with the Afghan leader at the presidential palace. U.S. officials said this was because of security concerns that rippled across Kabul in the wake of Saturday’s bombings. U.S. bases in the capital were on heightened alert. Mr. Hagel previously canceled scheduled visits to the Ministry of Defense—site of Saturday’s Kabul bombing—and the Interior Ministry. Instead, he met with the two ministers at alternative locations in the city. —Habib Khan Totakhil, Julian E. Barnes and Siobhan Gorman contributed to this article. … On a broadcast on FoxNews, Paul said that Holder explained that the President does not have the right to kill unarmed and non-combative Americans on American soil. Paul claimed a victory with this “answer”; however it is glossed over in the mainstream media that the response from Holder did not clarify who is a combatant. Based on the National Defense Authorization Act, anyone can be suspected of being a combatant by having alleged ties to a terrorist group. Just recently, the Department of Homeland Security (DHS) and the Federal Bureau of Investigations (FBI) have said that constitutionalists and anti-government groups are extremists and liken to being terrorist organizations. While both the mainstream and alternative media were focused on the dog-and-pony show conducted by Paul and Holder regarding drones, the House of Representatives approved a bill that would grant funding to the federal government through September of 2013 while a supposed major budget cut is running rampant, stifling the economic stance of the US government. House Representative Harold Rogers [R-KY], head of the Appropriations Committee introduced this resolution to the tune of $982 billion (just shy of 1 trillion dollars) to avoid a near complete governmental shutdown at the end of this month.The very same day of Paul’s 13 hour filibuster, the House secured funding for the federal government at the expense of taxpayers and under cover of a 13 hour distraction. While the rest of the country faces sequestering measures, the US Military Industrial Complex will be well funded to conduct their business. The Department of Defense (DoD), the Department of Veterans Affairs (VA) and Planned Parenthood would continue to remain funded with that nearly $1 trillion appropriated by the House resolution. The statement here is that Brennan swore to uphold the rights of Americans except their freedom of speech, right to bear arms and right to not have to be subjected to unreasonable searches and seizures. Considering Brennan’s history with drones and their current application by the DHS of drones to be used as surveillance tools on unsuspecting Americans, the ceremony is fitting. DHS have secured unmanned aerial vehicles that are equipped to conduct surveillance, intercept cellular communications and determine if the human target is armed. The California Assembly, specifically members Jeff Gorell and Steven Bradford, have collaborated to restrict the use of drones by the local police and state officials. Gorell and Bradford have introduced AB 1327 which states emphatically that the law enforcement utilizing drones for surveillance must have obtained a warrant prior to deployment of unmanned aerial vehicles. (b) A law enforcement agency may use an unmanned aircraft system, or contract for the use of an unmanned aircraft system, if it has a reasonable expectation that the unmanned aircraft system will collect evidence relating to criminal activity and if it has obtained a warrant based on probable cause pursuant to this code. (c) A law enforcement agency, without obtaining a warrant, may use an unmanned aircraft system, or contract for the use of an unmanned aircraft system, in emergency situations, including, but not limited to, fires, hostage crises, and search and rescue operations on land or water. While the reality and potential of drones flying in US skies is becoming part of a national debate, the US Air Force have suddenly stopped posting statistics on drone strikes in the Middle East, specifically Afghanistan. Statistics from last month conveniently went missing when the total analysis was published for the public to see. Both the Pentagon and Air Force Central Command declined to publically comment on the change. However this change coincided with Paul’s filibuster of Brennan over Holder’s comments that the President could strike American citizens with “lethal force” (using drones) on US soil. Editor’s note – Rand Paul authored an op ed piece entitled “My filibuster was just the beginning” on March 8. In this piece he wrote, “The Senate has the power to restrain the executive branch — and my filibuster was the beginning of the fight to restore a healthy balance of powers. The president still needs to definitively say that the United States will not kill American noncombatants [bold italics added]. The Constitution’s Fifth Amendment applies to all Americans; there are no exceptions.” By writing this Sen. Paul was conceding that some US citizens may be declared combatants or enemy combatants. There is no constitutional basis to declare US citizens “combatants” or enemy combatants since there is no constitutional basis for war. War may only be declared by Congress under Article I section 8 clause 11 – the “War on Terror” is illegal and a hoax. Furthermore if the USA was involved in a legal war, i.e., if Congress did declare war against a nation or nations and US citizens aligned with enemy nations against the US, those so accused would still be guaranteed a right to an open trial under Article III section 3 clause 1. What is it going to take for pastors and churches to wake up and realize that America is in the throes of a burgeoning police state? Ladies and gentlemen, the long-standing veneration for law and order does not include blind submission to governmental abuse of power. Yet, it seems that very few Christian conservatives are even paying attention to what is happening before their very eyes. For example, the Department of Homeland Security (DHS) has purchased over 2 billion rounds of hollow-point ammunition (enough to wage a 30-year war); the DHS has purchased over 7,000 AR-15s. The DHS calls them Personal Defense Weapons (PDW). These are the same semi-automatic rifles with high capacity magazines that when you and I buy them are called “assault rifles.” Plus, the DHS has purchased over 2,700 armored vehicles, the same kind that the US military uses in Iraq and Afghanistan. The Department of Defense (DOD) calls them MRAP (Mine Resistant Ambush Protected). They carry .50 caliber weapons that fire from inside the vehicle. The vehicle itself is impervious to mines and small-arms fire. They are the vehicle of choice for our combat troops in the Middle East. Pray tell, why does the DHS need that kind of firepower? And who do they anticipate using all of this firepower on? If all of that isn’t disconcerting enough, we have now learned that the DHS has spent 2 million dollars on producing shooting targets of American gun owners. These are called “non-traditional threat” targets. They include pregnant women, elderly citizens, mothers in playgrounds, and even little children. These targets are produced by a company called Law Enforcement Targets, Inc. The company calls these targets “No More Hesitation” targets. What is the DHS planning to do? Turn the entire continental United States into one big giant Waco? Can one imagine the reaction by the DHS if a company was producing shooting targets depicting law enforcement officers? I guess another question I have is who are the people whose faces appear on these targets? Did they know they were being photographed to be used on a shooting target? Or were their images photoshopped? Whose mother, father, grandmother, grandfather, daughter, son, and child are being used for these targets? I wonder how many Americans whose loved ones appear on these targets know that the photographs of their family members are being used as targets for DHS agents to shoot at. And how would any of you like it if those targets bore the photographs of YOUR loved ones? This is bizarre! If this wasn’t so very, very real, one would think that it was one big practical joke. But it is no joke! While our own domestic federal police department (a blatantly unconstitutional entity, by the way) is arming itself to the teeth, our President and Vice President are in a full-court press trying to disarm the American citizenry of their most effective and efficient self-defense tool: the semi-automatic rifle. Are we supposed to believe that all of this is mere coincidence? It is true that I was born in the morning, but it was not yesterday morning! Adding to our cause for concern is the way our veterans are being treated (or should I say mistreated) by the federal government. As far back as 2009, returning Iraq and Afghan War veterans have been labeled as potentially “dangerous extremists” by the DHS (along with people who are pro-life; people who support Ron Paul, Bob Barr, and yours truly; people who believe the US should get out of the UN; people who are opposed to the “New World Order;” people who believe in the Second Coming of Jesus Christ; etc.). Today, more and more veterans are being labeled with PTSD (post-traumatic stress disorder), and other such names, and being told that they are not fit to possess a firearm. My friends, our country is being transformed into an Orwellian society right before our eyes! All the while, most pastors and churches seem to be completely oblivious to it. And, of course, most of the reporters and journalists in the mainstream media are nothing more than compliant propagandists for anything Big-Government. The same is true for most educators in our major colleges and universities. But it is the apathy, indifference, and blindness of our pastors and churches that is the most disconcerting. The most influential group of leaders in America is still the pastors–the trend away from traditional churches notwithstanding. There are over 300,000 evangelical churches in the United States. Can one imagine what would happen in this country if half of these pastors would get up in their pulpits this Sunday and sound the clarion call to stand up and fight these insidious encroachments against our liberties? What if 25% would? What would happen if only 10% would rise up and take a stand? Dear Christian friend, how can you stay in a church where the pastor will not take a stand for your liberties? How can you give such a church your tithes and offerings? Do you not realize that any pastor and church that refuses to fight and protect your liberties is helping to put the shackles of tyranny and oppression around the necks of your families? Regardless of how sound you believe your pastor to be doctrinally, or how educated he is, or how much Hebrew and Greek he knows, or how warm and caring he is, or how much you personally like him, if he is not willing to take a public stand for your liberties, he is a willing accomplice to the demise of our republic and the rise of totalitarianism in this land–as surely as the pastors of Germany were accomplices to the rise of Hitler’s Third Reich! Christian, please wake up! A police state is being constructed before your very eyes. Your liberties are being systematically expunged. While you are waving your hands and praising Jesus, the enemies of liberty are laying the nets and traps around your homes and communities that are going to be used to enslave you. While you are fixated on your pastor and church staying doctrinally pure, the barbed-wire fences are being built around the camps in which your children and grandchildren will be incarcerated. While you sit comfortably on the padded pews in your heated and air conditioned church sanctuary and listen to an inspiring sermon that makes you feel warm and fuzzy all over, the sacred principles that protect your right to freely worship, and speak, and defend your family are disappearing. Beyond that, not only are many thousands of pastors not resisting this emerging police state; they are actively and enthusiastically joining with the big-government toadies in helping to eviscerate our freedoms. Is your pastor one of these? If so, you might as well be listening to sermons written by Joseph Goebbels. Big-Government propagandists love to couch submission to oppression under the guise of patriotic duty to law and order. But submission to oppression is not patriotic; it is imbecilic! And make no mistake about it: the attempt to outlaw, ban, and confiscate our firearms, especially our semi-automatic rifles, has nothing to do with law and order; it has everything to do with overt oppression. To such an egregious encroachment against our liberty there can be no submission, only determined, resolute resistance. With would-be tyrants attacking our liberties with such a vengeance, and with such a ubiquitous display of apathy and indifference by most pastors and churches, my constitutional attorney son and I have written a brand new book entitled, “To Keep Or Not To Keep: Why Christians Should Not Give Up Their Guns.” This book is sure to be a blockbuster! There are numerous books out there which examine the right to keep and bear arms that are written from a constitutional perspective, but we know of no modern book that takes an in-depth scriptural look at the right to keep and bear arms. Well, that’s what our new book does. It is a thorough examination of both the Old and New Testament regarding the right of self-defense. In this book, Tim and I show conclusively that nowhere does the Bible teach Christians (or anyone else, Christian or not) should surrender their arms. Nowhere does the Bible teach Christians (or anyone else) are obligated to obey the laws of men that would deny a man his God-given, Natural right of self-defense. NOWHERE! All this talk about submitting to the government NO MATTER WHAT is simply a bunch of propagandist-hooey! And dear Christian friend, if your pastor is teaching this fallacy, not only is he teaching a serious error, he is an enemy to freedom! Get out of his church immediately! He has sold his soul to tyrants; and he is leading your family into tyranny. Our country is being turned into a police state. What is it going to take for pastors and churches to awaken to this stark reality? Christian, please wake up! If you don’t see your pastor’s name in the list, you might want to ask him why. The entire premise of the “War on Terror” must be rejected. First and foremost it’s illegal and therefore illegitimate. Article I Section 8 of the Constitution states that Congress has the legal authority to declare war. Any war that’s undertaken without a declaration of war by Congress is illegal. This illegal practice of an executive or presidential war has characterized all US wars after World War II. President Eisenhower committed the US to the Korean War under the authority of the United Nations, not Congress. If you think the war in Afghanistan was justified it was still illegal in that Congress never declared war against Afghanistan. US forces continue to be deployed and engaged in Afghanistan after 10 years yet our nation managed to end World War II within 4 and a half years. Illegal wars often have no clear objectives and therefore may be used as pretext to indefinitely continue hostilities. Another terrible result of illegal wars is that no clear resolution is ever achieved, i.e., “winning” is elusive if not impossible. When the objectives of a military invasion are intentionally ambiguous the results are also ambiguous. The fact that the “War on Terror” is ambiguous is intentional. By claiming that our nation is at war the federal government continues to exercise carte blanche to incrementally nullify the Constitution, especially the Bill of Rights. All of the unconstitutional executive orders and legislation that began during the Bush administration have been accepted and expanded under the Obama administration. Understanding the illegal and irrational nature of the “War on Terror” helps expose the two party system as a sham. It’s naïve to claim that the Republican Party is to the right of the Democratic Party when the Obama administration has advanced the “War on Terror”. The inherently bogus conflict between the Right and the Left is also evident in that both parties in Congress have passed legislation related to the “War on Terror”. Senator Lieberman stressed that the greatest threat to the “homeland” are homegrown terrorists who are radicalized Americans. Amendment V- No person shall be held to answer for a capital, or otherwise infamous crime, unless on a presentment or indictment of a grand jury, except in cases arising in the land or naval forces, or in the militia, when in actual service in time of war or public danger; nor shall any person be subject for the same offense to be twice put in jeopardy of life or limb; nor shall be compelled in any criminal case to be a witness against himself, nor be deprived of life, liberty, or property, without due process of law; nor shall private property be taken for public use, without just compensation. The “War on Terror” is a massive and growing hoax. This war is against the American populace and it continues to metastasize as the Constitution is methodically eviscerated and our country is being transitioned into martial law. The entire post 9/11 domestic security apparatus was designed to help erect a police state- the aim was never foreign terrorists. If the “War on Terror” was valid the border with Mexico would have been secured shortly after 9/11/01. Under both the Republican Bush and Democratic Obama administrations the border with Mexico remains unsecured. However the TSA, as part of DHS, is being expanded beyond airports to rail stations, subways and other points of mass transit. Regardless of presidential executive orders, court decisions or Congressional legislation, no laws that contradict the Constitution are legitimate. “All laws which are repugnant to the Constitution, are null and void.” (Chief Justice Marshall, Marbury v. Madison). Our Founding Fathers keenly understood liberty as well as tyranny. “They that can give up essential liberty to purchase a little temporary safety, deserve neither liberty nor safety.” (Benjamin Franklin). “He that would make his own liberty secure, must guard even his enemy from oppression; for if he violates this duty, he establishes a precedent that will reach to himself” (Thomas Paine). “I believe there are more instances of the abridgement of the rights of the people by the gradual & silent encroachments of those in power than by violent & sudden usurpations.” (James Madison). “If the federal government should overpass the just bounds of its authority and make a tyrannical use of its powers, the people, whose creature it is, must appeal to the standard they have formed, and take such measures to redress the injury done to the Constitution as the exigency may suggest and prudence justify” (Alexander Hamilton). May God grant us the wisdom to understand the gravity of our situation and the courage to help restore the Republic. Domestic Extremism Lexicon; 26 March 2009; (U) Prepared by the Strategic Analysis Group and the Extremism and Radicalization Branch, Homeland Environment Threat Analysis Division.